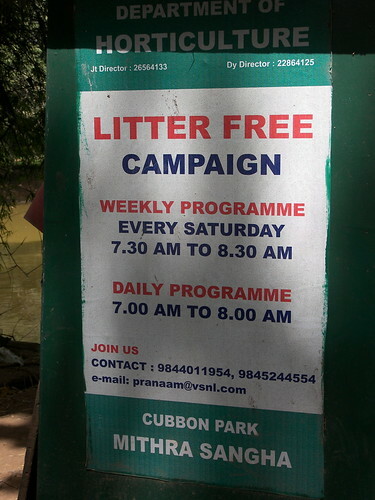 Bangalore Metblogs » Join Cubbon Park Mithra Sangha – Be friends with Cubbon Park!! If you thought this is only for the old or the kids, think again! There are many groups involving youngsters who hit this place to maintain themselves and connect with the environment. Now when Cubbon Park has so much to offer, this place needs to be maintained well. The government authorities do take care of the basic requirements in this place but seems they do need a helping hand. That’s when a voulntary organization called the Cubbon Park Mitra Sanga has stepped in. It is a group of caring citizens who have come forward to maintain this place. They play the role of the catalysts who remind the Government to do their job also take charge of few things when they fail to get a response. And this group works solely on the interest and efforts from the Bangaloreans. Cubbon Park Mithra Sangha is small group of environment conscious people formed by Mr. Narendranath an architect three years ago. It has started the task of spreading awareness among the users by picking up garbage over week ends. It also periodically interacts with the officials of Government horticultural department and brings home issues like, fencing, protecting the flowerbeds and lawns, repairs and improvements. It also invites volunteers from various organisations to participate in litter picking and spread awareness. The aim of the Cubbon Park Mithra Sangha is to catch the young visitors to Balbhavan and inculcate them the need for control in generating garbage and its proper collection, segregation and handing over to Corporation garbage collection system in a proper manner. They need volunteers like you and me to carry out activities which would retain a balance in this place. They have many successful activities to their credit and they are still looking forward to have enthusiastic individuals who can contribute with their presence for their activities or just being a well wisher. Together let’s make a difference in a small way so that this makes a great path for the rest to follow ! !